This is a Flickr badge showing public photos and videos from BluesFestivalGuide. Make your own badge here. Each week, Blues fans get their year-round e-newsletter in their inbox jam-packed with the latest blues CD releases, industry news, contests, House of Blues Radio Hour, Roots Blues Airplay Charts and upcoming blues festivals and much more! All Internet sites have the ability to collect information about you. We encourage you to read the privacy statements of every site you visit. When you fill out an information form on our site such as submitting a festival or business link, you give information directly to us. Also when you pay from the Plug and Pay link on your invoice, you are providing personal information. In keeping with RBA Publishing Inc, we do not share Personal Information with anyone, except as described below. You may pay us by check or money order. We do not save information from these forms of payment. We will still communicate with you in connection with servicing your account, fulfilling your request, or administering any promotion or any program in which you may have elected to participate. Materials we send you may still include some offers or promotions. RBA Publishing Inc is the parent company of these brands: Blues Festival Guide, Blues Festival e-Guide, Reggae Festival Guide, Reggae eGuide, Reggae Guide for iPhone. © 2002- 2013 RBA Publishing Inc. All Rights Reserved. Information on this site may not be copied or published without permission. Every effort has been made to ensure that the contents of this site are accurate but are not guaranteed. The right is reserved to edit information, features, and prices without prior notice. 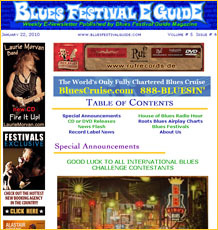 Blues Festival Guide magazine's online directory of Blues Festivals and print magazine information. Blues Festival Guide, Blues Festivals, Blues Festival, Blues Fest.